Sorry for the super long delay on this...I meant to post this months ago but just like his music, Dom's interviews are timeless lol. Check out my interview and PLEASE check the music if you haven't already. Dude is nice. After the interview click here to see a new video of his and DL his last CD, From the Westside with Love. Essince: How’re you you doin’, man? Dom Kennedy: Alright. Alright. I’m good. Chillin’ right now. Essince: What made you start rhyming? What made you get into hiphop? 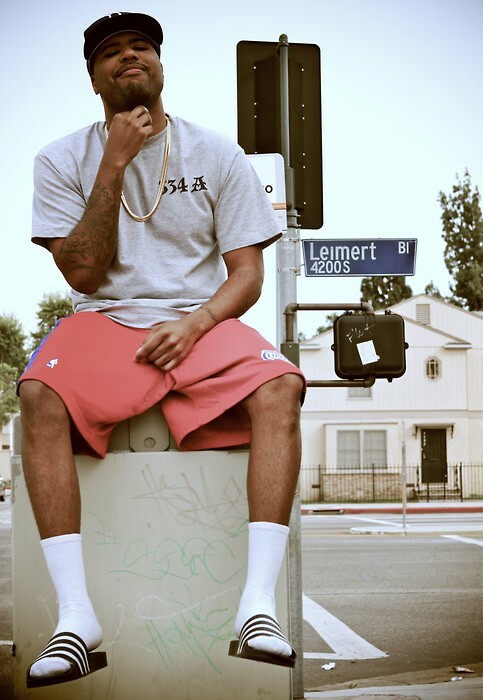 Dom Kennedy: Really, being a fan of the music. Just the feelings, the way it made you feel, and the stories, most importantly; the stories and how they connect to your everyday life and how they were relatable. I mean I kinda guess I started like a lot of people do, I guess adding my little twist on popular songs when I was really young. I can just remember changing a person’s city, you know? Wherever they shouted out I added my little city in there, you know? Or my homies. Things like that. Not knowing that would lead to rap or anything like that. Then eventually I started writing in like junior high is when I would really start writing stuff and messing with it but it wasn’t until about 4 years ago when I decided that this is what I wanted to do. Essince: Where you ever involved in any other aspects of hip hop? Like breakdancing or did you DJ or do graffiti or anything? Dom Kennedy: Nah, I never did any of those things. My cousin was a DJ. I mean, I always had records and things like that. But, nope! I was never a DJ, didn’t breakdance, I didn’t do anything. I was always the one with, you know, something to say. And I had a way with telling stories. Essince: That’s one thing I really noticed with [your album] From the Westside with Love. It kinda takes me back to when I would listen to Outkast when I was younger and would feel like I was in Georgia. I felt like I understood everything they were saying even though I’d never been there. Some of your stuff, especially this last one, I really feel like I’m back in LA. What influences you to, I guess, try and make things relatable? Dom Kennedy: People like Outkast, like you said. You know just the history of rap music and the great artists and groups that have come before and the ones I like the most; the people that gave me the feeling like you just said. You know like when Bone Thugs N Harmony first came out, the whole Cleveland sound. Everybody that was special’s, at least to me, sound was relatable directly to that area and their community. Biggie Smalls, Ice Cube, DJ Quik, Outkast, they were all different. Their music was like you said; you can sit back and listen to it and you can remember streets and things that they talked about. The feeling that you got from me, automatically liking that, is something that, I guess without even question...I probably throw myself into my music. It’s not something that I consciously try to do it’s just what I do. To me [there’s] no other thing to do but to talk about my circumstances in my city and my friends and just being a kid from LA. [It] is all I know. Essince: With hip hop, certain areas are popular for awhile. Texas was big for awhile then Atlanta. California seems to have been kinda ignored but sustaining itself for awhile. How do you plan on getting out of that? Dom Kennedy: I don’t know if it’s something that I necessarily worry about but I figure if I tell my story in its truest form then it’s gonna take care of itself. You know the things I talk about is a story of a kid from LA at the end of the day, but the stories about friends, about girls, about love, about having fun these are things people from all over the world go through. You know? It’s not just specific to just me or just LA. Those are things that everyone can relate to it’s just that LA is where my story takes place. I think the thing that draws people to my music is that they can apply...they can take my stories and just add it to their lives. You know, it’s just that relatability. Mine just happens to take place in LA. Somebody else’s might be in New York, somebody else’s is in Miami or in DC, you know? OC or wherever but the subjects are still the same. We all go through the same things, pretty much. E: What are some of your goals with your music? DK: Some of my goals are just, you know, honesty. To be responsible for my fans for my friends and making us look good at all costs. And anytime my record comes out, or I perform, or a song comes on I wanna be honest and and be able to hold my head up. My music is played no matter who’s there or what type of setting or circumstance. I wanna be able to say this is accurate. I’m proud of this. So I try to give my all, you know? Maintain my integrity with my music. Those are my main goals on a basic level as being an artist and a person. I have to live with this at the end of the day. When I’m 30 I’ll have to look back and say that’s exactly how it was. You know, you can play that and it will say something about what I was doing or how we were living at that time. E: Do you have any aspirations to do movies or anything like that? DK: Maybe to write movies, not to be in any movies. Or maybe create songs for movies and stuff like that. I approach my songs like movies anyway and my songs they are so visual. It’s just an audio recording but I try to make every song like if I had to make a video for it. You should be able to listen to it and see it. You can come up with your own concept for it or whatever. I would love to write a movie some day. E: You don’t want to be in one? E: I never wanted to be either. I thought it’d be cool to be in like, the background of a movie. Or being the guy who has like one line in the movie but I don’t want to be the main character. So in the credits it’ll say “Guy with Briefcase: Essince”. [both laugh]. E: Alright, lastly, what can we expect from Dom Kennedy? DK: Booking shows. Nothing concrete yet but we’re putting a few things together with myself and a few other artists from LA. That’s really what I’m working on, working on my stage presence and just being visual and going out to different cities and performing and getting a chance to feel the energy of the people, getting their thoughts on the project . Essince: How can someone get a hold of you? How can we find Dom Kennedy on the internet? Dom Kennedy: Definitely on my website, www.DopeItsDom.com and on twitter, the same thing www.twitter.com/dopeitsdom and my myspace is www.myspace.com/domkennedy but those three are what I’m on the most. Twitter if you wanna follow me closely and hear my thoughts. I talk about my shows. [You can check] my website for updates on my music and all that type of stuff. Check the video for "Locals Only" here.